Today we will be covering a very important topic from the Advance Maths part of the Quantitative Aptitude section that is – Important notes on Triangles and their Properties. Note: Where, s = (m1+m2+m3)/2, m1,m2,m3 are three medians of the Triangle. Case I, b2 +c2 is greater than a2 then angle A is acute. Case II, b2 +c2 is smaller than a2 then angle A is obtuse. Case III, b2 +c2 is equals to a2 then angle A is Right Angle. Ques: Find the type of the triangle ABC whose 3 sides are of length 11, 3 & 9. Square of largest side is 112 = 121. Hence, this triangle is obtuse angled triangle. The medians of a triangle are line segments joining each vertex to the midpoint of the opposite side. The medians always intersect in a single point, called the centroid. 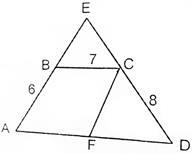 In the adjoining figure D, E, & F are midpoints of the side of the triangle while Line Segment AD, BE & CF are median. They are meeting at a common point I which is the centroid. All 3 median of a triangle divides the triangle in 6 equal parts. 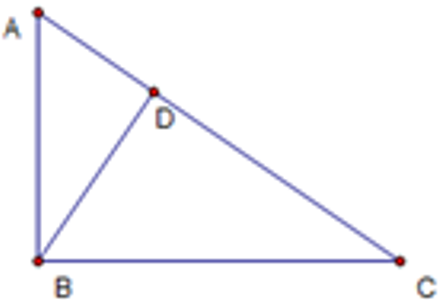 Angle bisectors are the line segment which bisects the internal angles of the triangle. All the three angle bisectors meet at a common point called as Incentre. In the adjoining figure Line Segment A1T1, A2T2, & A3T3 are Angle Bisector. While point I is Incentre of the triangle. Incentre is the only point from which we can draw a circle inside the triangle which will touch all the sides of the triangle at exactly one point & this circle has a special name known as Incircle. And the radius of this circle is known as Inradius. When the perpendicular bisectors of the side of the triangle is drawn they meet at a common point known as circumcentre. This circumcentre is a special point as from this point we can draw a circle which will enclose the triangle in a way that all the vertex of the triangle lie on the circle. The radius of this circle is known as circumradius. In the adjoining figure DP, EP, & FP are perpendicular bisector of sides of the triangle. Point P is circumcentre. The orthocenter of a triangle is the point where the three altitudes meet. This point may be inside, outside, or on the triangle. In the adjoining figure AD, BE, & CF are three altitudes of a triangle. And point O is the orthocenter. The ratio of sides of triangle is proportional to each other. The height, angle bisector, inradius & circumradius are proportional to the sides of triangle. The areas of the triangles are proportional to the square of the sides of the corresponding triangle. If AB = 6cm, DE = 10cm & Area of ∆ABC is 135 sqcm. Find Area of ∆DEF. 135/ Area ∆DEF = (6/10)2 , Area ∆DEF = 135*(5/3)2 = 375 sqcm. In a right angled triangle, the triangles on each sides of the altitude drawn from the vertex of the right angle to the hypotenuse are similar to each other and to the parent triangle. Proof: In ∆ ABC & ∆ ABD. Angle B and Angle D is 90o. & Angle A is common in both. Hence by AA rule Both triangles are similar. (1)In the given figure =? In star like figure we calculate the sum of angle by using formula (n-4) 180, when n is the number of point in the star.